The Drover House Longhorns, furniture and artwork ends up with some interesting people and in some amazing places. For a week in April of 2014 The Conan O'Brien Show was filmed at the Majestic Theater in Dallas. The show ordered a pair of Longhorns for the front of Conan's desk and a small pair for the front of Andy's mechanical podium. 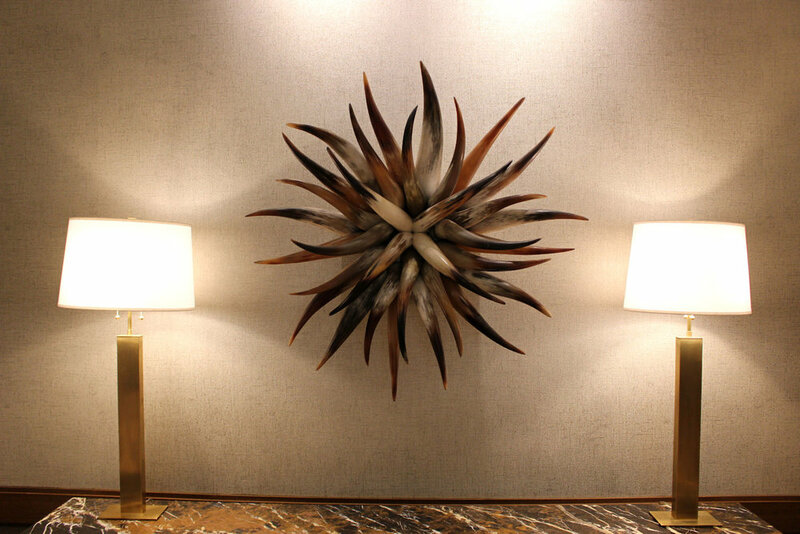 The original Flor de Cuerno (Flower of horn) sculpture now hangs in a clients luxury suite at Darrell K. Royal- Texas Memorial Stadium, University of Texas at Austin. The Flor de Cuerno 2 now resides at the Gaylord Texan Resort in Grapevine Texas. It hangs in the hallway just outside the Vineyard Ballroom. Here are Drover House horns in one of the only homes in Manhattan that has a swimming pool inside of it. The home was featured as a Wall Street Journal house of the week and on HGTV's Selling New York. Here are The Drover House Longhorns on the DIY networks Man Caves T.V. show where they turned a garage into an old west Saloon. Here is The Saunders Desk Chair inside of the home of Western Art collector Bob Sandroni. This picture was part of the Western Art and Architecture Magazine's article on the Sandronis and their home. This is a bicycle with with custom built handlebars made with a pair of Longhorns. This bike can now be seen cruising the beaches of California. A number of horns hang in the beautiful home of a great client in Fort Worth, Texas. Two custom built Texas Longhorn mounts were presented at the christening of an oil platform off of the coast of Texas.